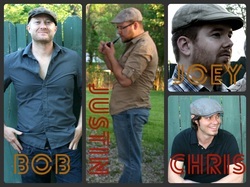 Roustabout is a folk band steeped in Americana. Sounds include bluegrass, folk, indie, with a tinge of groove. Expect an intimate stripped down sound delivered with great vocal harmonies, and as many different acoustic instruments as four guys can play (guitars, banjo, mandolin, ukulele, harmonica, upright and electric bass, and percussion). While playing mostly in bars and other venues in NE Indiana, Roustabout has played private parties, benefit concerts, and weddings.